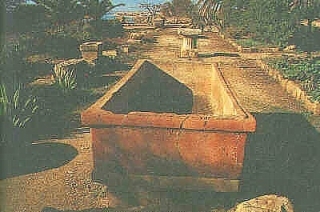 Several are the necropolis of Selinunte, and with numerous tombs, and only in more recent times it was possible to carry out studies and excavations that have brought to light various aspects and findings, which they come indeed thousands objects, especially vases and terracotta statuettes, which were used to protect and accompany the deceased in his journey into the. 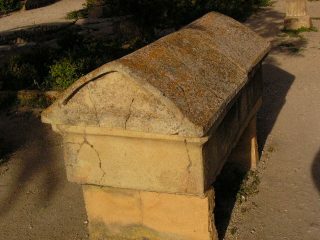 Some of the necropolis were found to 5-7 km away in the city, and this suggests that some of them not directly belonged to the city of Selinunte. Funerary rites from the studies conducted were two, the burial and cremation. The first involved the placement of the body of the deceased in the graves cut in the tuff, with the second cremati the remains were specially located in funerary urns. Necropolis of Selinunte identified and are recognized: that within the 'Acropolis of Selinunte on Base of Manuzza; a second north of the temples of eastern hill in the so-called contrada Buffa; identified the third necropolis north-east of the plateau in the area of Manuzza of contrada Galera Bagliazzo , and finally the fourth necropolis is located west of the river Modione later Sanctuary of Malaphóros in contrada Manicalunga Timpone.